Blind-box memorabilia releases are common these days, but 2019 Upper Deck Authenticated Buckets Autographed Basketball applies the concept to the stacked NBA lineup of UDA signers. 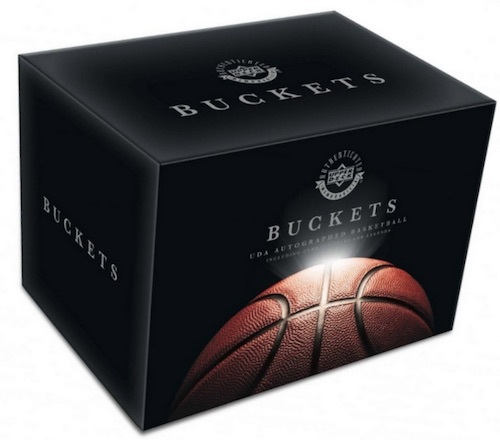 First announced at Upper Deck's 2019 CDD Conference, each box includes one random basketball with a shot at some of UD's biggest names, including Michael Jordan and LeBron James. While the item waiting in each box of 2019 Upper Deck Authenticated Buckets Autographed Basketball is a premium collectible, the format itself is very simple. Collectors essentially roll the dice on a signed ball that is individually sealed and packed out four per case. Inscriptions can be found randomly, as can the Molten basketballs in gold. The limited product also features multi-signed chase basketballs for Michael Jordan and LeBron James. Some of these are hand-numbered, as well. In addition, special boxes of 2019 Upper Deck Authenticated Buckets Autographed Basketball add something extra. Featuring MJ, LBJ and Ben Simmons, these bonus boxes pair a redemption for a signed jersey with a signed basketball for the same star player. Subject to change. The final checklist will be added as soon as it is available. Upper Deck Buckets Basketball - MICHAEL JORDAN Auto Molten Gold Trophy Ball!! 2019 Upper Deck UDA Buckets Signed Auto Basketball Sealed Box Lebron? Jordan?